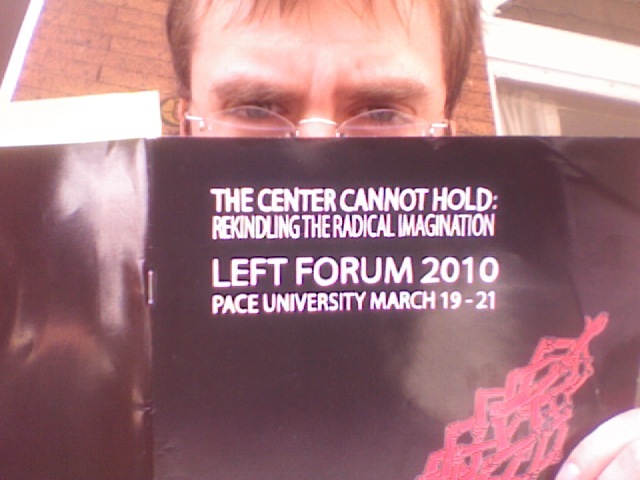 Below are video of 3 different panels from the March 2010 Left Forum in New York City. There is a lot of stuff here so let me describe and recommend a few highlights for viewers with less time on their hands. Probably the most frequent question I get from viewers/readers is: “Okay, you have critiqued capitalism. Now what is the solution?” I usually respond by saying that we need to understand the problem better before we can begin to articulate solutions. Here, I am pleased to post some thoughts on what it means to overthrow capital and some of the ways it can be thought about: Check out Anne Jaclard and Andrew Kliman’s talks on the “Future of World Capitalism” series, panel 1, and the discussion that followed. These will be of interest to many viewers who want to know what it means to overthrow the law of value. There is plenty on the economic crisis here. I speak on the relevance of Marx’s theoretical ordering of categories to his theory of crisis and how such a perspective might help us understand the debates amongst Marxists on how to understand the crisis. (This is a revised version of my talk at the Rethinking Marxism conference last November). Andrew Kliman’s talk on that same panel discusses his ground-breaking paper which claims that the current crisis is best explained through Marx’s theory of the tendency of the rate of profit to fall. Anne Jaclard critiques the financial theories of crisis popular on the left. Alan Freeman, on the Future of World Capitalism 2 series, discuses the way the state is essential in preparing the way for a boom after a crisis. And Jack Rasmus discusses the problems in mainstream and Marxist theories of financial bubbles. I can’t say I agree with all of Rasmus’s characterizations of Marx’s value theory. Check the discussion for Freeman’s reply to some of Rasmus’s statements. The “Future of World Capitalism” series is a book series to be published by Radical Daemon books. These two panels contain short presentations by 6 different authors on the topics of their books. In addition to the topics mentioned above, there is a great presentation by Henry Heller on the origins of capitalism. Heller argues that rather than seeing capitalism as a natural evolution of pure economic logic we need to understand the political origins of capitalism. Costas Panviotakis argues that we need to re-conceptualize the notion of scarcity in our attempt to envisage a post-capitalist society. And Radhika Desai challenges the popular notions of “globalization” and American hegemony that are usually used to characterize the neoliberal era. This entry was posted in Uncategorized and tagged capitalism, communism, crisis, desai, economics, freeman, heller, jaclard, kliman, left forum, marx, panviotakis, rasmus, socialism, tssi, value. Bookmark the permalink. Thanks for posting these terrific videos. I am really enjoying watching them and still working my way through them. Is it possible to put up Andrew Kliman’s “Not another money labor scheme?” I am really curious what that talk is about. I consider Kliman’s paper on the falling rate of profit to be extremely important, but I think in his talk on the causes of the crisis, he is conflating public and private debt when they really should be considered separately. The public debt of the US government, which is the monopoly issuer of its own flexible exchange-rate fiat currency, is not really “debt” in any meaningful sense. Such a government can never really face a financial constraint – only resource and political constraints. It is different for governments who tie themselves to a common currency or a fixed or pegged exchange rate. Such governments do face financial constraints. However, public debt in countries such as the US, UK, Canada, Australia, Denmark, etc., has no need to exist. For a trade-deficit economy such as the US, it is impossible for the private sector to net save unless the budget deficit exceeds the trade deficit. Kliman’s own graphs clearly show that the accumulation of private debt is simply the reflection of the movement in public debt. The massive budget deficits at the end of WWII directly preceded a period of relatively low private debt and strong growth. Since the breakdown of Bretton Woods, there has been a tendency toward fiscal austerity in the sense that budget deficits were insufficient to facilitate private net saving intentions together with demand sufficient to sustain full-employment output. The fiscal austerity has corresponded with an unsustainable accumulation of private debt and crises from which, as Kliman shows, no sustainable recovery has been achieved. The recent recourse to public debt necessitated by the global crisis has enabled some net private saving to pay off private debt, but much more would be needed to bring private debt levels down to sustainable levels. To take an extreme example for illustrative purposes, if all profit is reinvested (Cp = 0) and there is no capital depreciation (gross investment = net investment), K = 1000 initially, and I = 100 each year, r in successive periods would be 100/1000, 100/1100, 100/1200, … etc; i.e. a falling rate of profit as capital intensity increases. The tendency is mitigated to the extent that K depreciates, and is overcome through crises and the violent devaluation of K.
It is interesting to note that there is a possible, though unlikely, “out” from Marx’s tendency in this pure private economy. To the extent capitalists consume rather than invest, aggregate profit in the numerator is increased without expanding the fixed capital investment in the denominator. However, the out is unlikely to enable the avoidance of Marx’s tendency because capitalism compels capitalists to compete on cost through technical innovation as well as to compete for market share through expansion of capacity, both of which require investment rather than capitalist consumption. This expression indicates that, technically, it is now possible for the government to prevent the fall in the rate of profit through the use of budget deficits. There are limits to the government’s capacity to do this if the government operates under a commodity-backed money system, a common currency arrangement, or is attempting to maintain a fixed or pegged exchange rate. For instance, if the government is constrained to balance its budget over the business cycle, the average effect on the rate of profit must be zero, although fiscal policy could still be used to smooth movements in the rate of profit. Even these efforts are compromised by the requirement to maintain the exchange rate. However, in a flexible exchange-rate fiat currency regime, there is no such financial restriction on government. Budget deficits can be run in a non-inflationary manner provided there are resources, including labor resources, available for purchase. The constraints in such a system are resource and political constraints, not financial in nature. In fact, there is no need for the government to define public debt into existence at all. It has no real meaning. The motive for doing so is ideological and class-interested. Concerns over public “debt” legitimize austerity measures and attacks on general living conditions to the benefit of a small elite. Governments have continued to behave as if they were still bound by the constraints of Bretton Woods. They do this because it is in the interests of capital. It is not in the interests of the general population. I think the significance of fiat money also needs to be taken into account in discussions concerning the transformation from capitalism to socialism. I think the breakdown of commodity-backed money and the recourse to fiat money – which I would argue occurred because of the inability of capitalism to resolve Marx’s tendency other than through crisis – offers the first half-step away from capitalism. It is a half step because fiat money provides the potential for economic activity that is not constrained by the logic of capital. Such activity need not be constrained by financial or profit considerations, only resource availability. And capital can like it or lump it. But the recourse to fiat money is not a full step away from capitalism because so far we have chosen not to make use of its full social potential. I am still working my way through these videos and really enjoying them. I just wanted to make a couple of remarks somewhat related to my previous comment. I found it significant that both Freeman and Rasmus in Future of World Capitalism 2 stressed the role played by massive fiscal measures in finally getting the economy out of the Great Depression. I agree with this point. However, I think Rasmus misinterprets its significance, which causes him to dismiss the falling rate of profit as the fundamental cause of crisis. where Cp is capitalist consumption, I is gross investment, BD is the budget deficit and NX is net exports. Whereas private investment has the effect of increasing both aggregate profit, P, and private fixed capital, K, and therefore tends to cause a decline in the rate of profit as an expansionary phase proceeds, the significance of the budget deficit is that it can be used to increase P without increasing K. Rasmus does observe that recovery from the depression involved massive deficit expenditure and then a subsequent transfer of the resulting productive capacity to the private sector. Yet, he seems to miss the effect of this on the rate of profit. Government consumption expenditure increases capacity utilization and P with no effect on productive capacity or K. Government investment expenditure adds both to P and productive capacity, but not K. Together, these measures enable a huge increase in P relative to K, and hence a huge boost to the rate of profit. When the government sold off the newly produced infrastructure, technology, capacity, etc., to the private sector at bargain-basement prices (a dramatic cheapening of the elements of K), it directly enabled a massive expansion of private-sector productive capacity at very little cost to capital (very little impact on K). On a separate point, I didn’t understand why Rasmus thinks value is unmeasurable. Constant and variable capital can be regarded as sums of money, and so are just as measurable as anything else. At the aggregate level, we know total price equals total value, total profit equals total surplus value, and the average rate of profit equals the average rate of surplus value. All these are perfectly measurable. No doubt it is trickier to measure individual values, but in principle they are also measurable. Each individual capital can be accorded a portion of aggregate surplus value (aggregate profit) proportional to its monetary outlays on constant and variable capital. This proportional share is surplus value (which, in general, differs systematically from the individual capital’s profit), and can be added to the outlays on constant and variable capital to determine the individual value. In any case, the connection of crises to the tendency for the rate of profit to fall is fully understandable on the basis of aggregate variables. The crisis is a macroeconomic phenomenon, and its fundamental cause – the tendency of the rate of profit to fall – is a macroeconomic tendency, with effects that are felt economy-wide. I think you are asking the right type of questions and Kalecki’s work provides some important insights. It is a pre-print of an article to be published in a journal. Dave, thank you very much for the link to your paper. I find it very interesting and helpful. I have become interested in the neo-Chartalist view of money, especially as explained by Bill Mitchell at his billy blog (he calls it ‘modern monetary theory’ or MMT), and it made me curious about the connection between value and fiat money in flexible-exchange rate regimes. For that reason, I was excited when I saw you discuss the tax basis of the acceptance of money in connection with value and, later, the MELT. MMT, as I understand it, argues that the (domestic) value of fiat money relates to the difficulty of obtaining the currency for the purposes of meeting tax obligations. The value could be set, as a matter of policy, by the government setting a price for labor. For instance, under capitalism, MMT suggests the government could provide a job guarantee (JG) that paid minimum wage to those who would otherwise be unemployed. That would make the minimum wage an anchor for the value of the currency. For instance, if the minimum wage were $10/hr, the value of $1 would be 6 minutes of JG labor. If more skilled labor were paid $30/hr, the value of $1 could also be expressed as 2 minutes of skilled labor, etc. (Under socialism, all labor would be equal.) If the minimum wage increased to $15/hr, the value of the currency would fall to 4 minutes of JG labor. MMT suggests that the value of the currency will be stable – at least in terms of an absence of demand-side inflationary pressures – if the budget deficit is just sufficient to enable private net saving intentions and full-employment output. Budget deficits larger than this would cause demand-side inflation and reduce the value of the currency. There were many other aspects of your paper that I found very helpful as well. Can I ask, does the limit for the steady-state rate of profit apply to the temporal rate of profit in TSSI? Or are you using a simultaneist rate of profit? If the latter, what is your view of Andrew Kliman’s position in Reclaiming Capital? I found Kliman’s book very convincing on value. I think at the aggregate level the same results concerning the tendency of the average rate of profit will follow whether we think in price or value terms (? ), but temporality would make a difference (?). alienated, yes our view on money is neo-Chartalist and hence we agree that state spending is logically prior to taxes. However, our understanding of this process is based on historical-materialism. The steady-state rate in our paper is derived for a ‘simultaneist rate of profit’, i.e. R = P/K where P is the flow of profit per annum (say) and K is the current value of the stock of capital invested. What we show is that over the entire distribution of profit rates in the economy, the average rate is bound to follow the steady-state rate R*. I’ve not tried to derive it on the basis of a ‘temporal profit rate’. My immediate guess is that it would look similar but the labour productivity term would disappear. I’m far less convinced by Kliman’s take about labour-value. But that is a separate post.